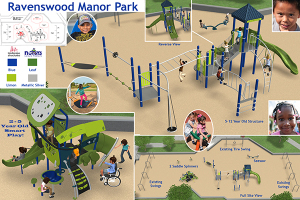 In coordination with the Ravenswood Manor Improvement Association, HPAC gathered input on four design options that the Chicago Park District offered to install at Ravenswood Manor Park as part of its Chicago Plays initiative. The intentions of the program are to upgrade all playgrounds to new standards and provide safe and maintainable play equipment for the next generation. We received nearly 350 responses to the survey, and the winning option was Nutoys. This option will provide two new play structures, one for 2-5 year olds and another for 5-12 year olds. It retains the existing toddler swings, the large swingset and the tire swing. In addition, two new saddle spinners, a see saw and new engineered wood fibar ground surface will be installed. 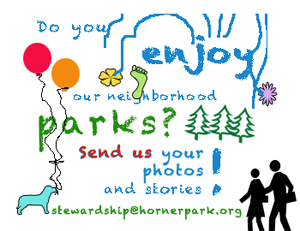 Your votes and comments were compiled and forwarded to the Chicago Park District. Regarding whether this project should be accomplished immediately or deferred until later the votes were 82% in favor of installing the new equipment as soon as possible. In addition due to a transfer of liability the old equipment cannot be repurposed for other playgrounds. The Chicago Park District expects the new equipment to be installed as shown in the illustration and the work will take place later this year. HPAC thanks all of those that participated in the survey and we look forward to completion of this project.